Every book has its quirks. In the case of the newly published history “American Canopy: Trees, Forests, and the Making of a Nation,” the prevailing eccentricity is that it’s not primarily about trees. The leitmotif of author Eric Rutkow is wood, chiefly how North American virgin forest gave rise to a new nation, and how the U.S. has reduced that resource from close to a billion acres of ancient woodland to what is now more like 750 million acres of often young trees. 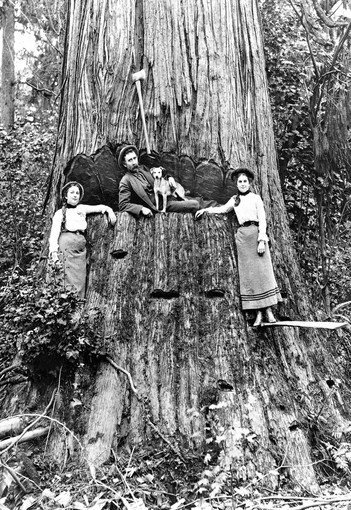 Click here to keep reading the review of the fine new history of American forestry in the Los Angeles Times. For a look at the future of Western forests, click here for an interview by environment reporter Ilsa Setziol with Ronald Lanner, the presiding expert on Sierra conifers. Emily: A rip roarin’ review; rip saws and roarin’ forest fires. Thanks. I have to check Chance of Rain more frequently.